Last night I really enjoyed listening to the blues band ‘Split Whiskers’. Especially the harmonica player who had a great sounding harp thanks to a little handheld mic called the ‘Harmonica Honker’. 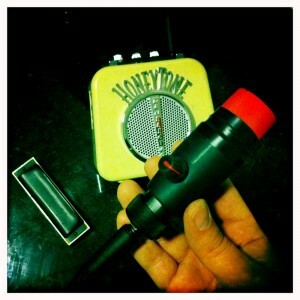 I was inspired to create my own harmonica mic and so after a trip to Maplin, I spent this evening building one. The hardest part was drinking a small bottle of Mountain Dew (toxic filth) as I was intending to use the bottle as the body of the mic. It didn’t quite work so I hacked the mic casing together from a WD40 lid, the Mountain Dew bottle cap and a mysterious piece of black tubing I found during a garage clear out. The mic not only works, but it sounds great. It’s a little late in the day for a proper test so I’ll have a play tomorrow & post the results. Oh …. Oh my …. Oh i can’t wait to hear that baby … f***ing genius fella.